According to Rogue Valley International-Medford Airport Security Deputy Director Debbie Smith, the plane has now been removed and the runway reopened as of 11:13 this morning. 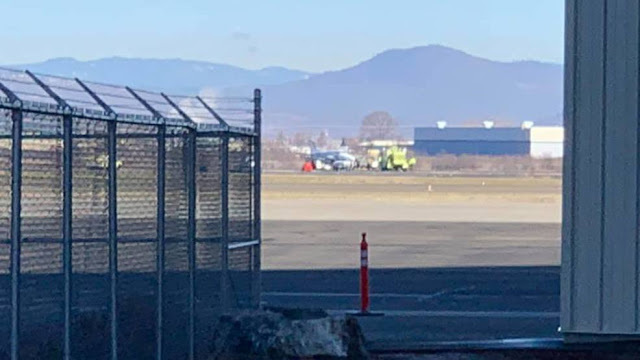 An emergency landing by a cargo plane at Rogue Valley International-Medford Airport Thursday morning forced the closure of a runway as emergency personnel responded. Federal Aviation Administration spokesperson Allen Kenitzer said the AMF flight 1908, a Beech BE99 type aircraft, landed gear up on runway 14 and is currently disabled on the runway. Initial reports indicate the plane had a landing gear malfunction. The cause is now under investigation by the National Transportation Safety Board and the Federal Aviation Administration. Medford Fire-Rescue responded, but there were no injuries reported. The cargo plane which was coming from Portland had one pilot and one other person, according to Federal Aviation Administration. At least two flights have already been diverted to Eugene with the runway closure. Right now officials are seeking approval to move the aircraft which has prevented all air traffic from landing or taking off from the airport.